Members of this genus include small to moderately-sized mygalomorphs that build subterranean burrows with silken trapdoor entrances (Coyle, 1974; Coyle & Icenogle 1994). Of the 11 described species, 10 are restricted to California, with a single geographically-isolated species (A. isolatus) from mountains in central Arizona. These spiders are found in many different types of habitats, ranging from redwood forest to mesic oak woodland to xeric chaparral or high (Mojave) desert. 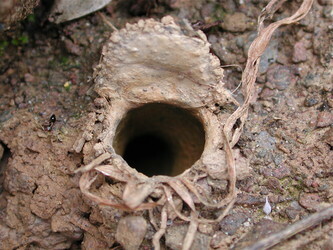 Within these broader habitat types, spiders are generally found building burrows in sheltered microhabitats, including north-facing banks, ravines, shaded roadcuts, etc. Coyle (1974, 1994) used a combination of morphological characteristics, habitat use and trapdoor architecture to understand species-level relationships in Aliatypus. These studies suggest that A. gulosus is the most early-diverging member of the genus - male and female genitalic features support this conclusion. The remaining species fall into 2 primary species groups, including the A. californicus group and the A. erebus group. The erebus group members possess large sternal sigilla, building relatively broad trapdoors on fairly shallow slopes. Members of the californicus group possess small sternal sigilla, building more narrow trapdoors on steeper slopes. The phylogenetic placement of Aliatypus thompsoni is uncertain, as this species shares features with both species groups. Coyle, F.A., 1974. Systematics of the trapdoor spider genus Aliatypus (Araneae: Antrodiaetidae). Psyche 81, 431-500. Coyle, F.A. 1994. Cladistic analysis of the species of the trapdoor spider genus Aliatypus (Araneae, Antrodieatidae). Journal of Arachnology 22:218-224. Coyle, F.A. and W.R. Icenogle. 1994. 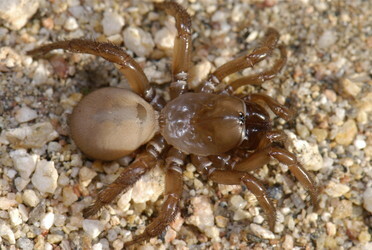 Natural history of the California trapdoor spider genus Aliatypus (Araneae, Antrodiaetidae). Journal of Arachnology 22:225-255. Page: Tree of Life Aliatypus Smith, 1908. Authored by Marshal Hedin. The TEXT of this page is licensed under the Creative Commons Attribution-NonCommercial License - Version 3.0. Note that images and other media featured on this page are each governed by their own license, and they may or may not be available for reuse. Click on an image or a media link to access the media data window, which provides the relevant licensing information. For the general terms and conditions of ToL material reuse and redistribution, please see the Tree of Life Copyright Policies.